OPINION: Why is Alaimo and a Mt. Laurel PAC so interested in a Moorestown BOE election? The ad was paid for by Citizens for a Great Mount Laurel (CFGML) of 1 Godfrey Ct, Mt Laurel. Why is a Mount Laurel political action committee (PAC) with over $22,000 in the bank at the end of June trying to influence Moorestown BOE elections? One of the biggest contributors ($7200 in 2nd quarter 2017) is Alaimo Engineering (Moorestown’s Township Engineer.) Let that sink in: Moorestown’s Township Engineer paid $7200 to a Mt. Laurel PAC that has an interest in influencing Moorestown’s BOE elections. None of the five listed contributors to CFGML in the most recent filing (who contributed $18,000 out of a total $18,450) are Moorestown residents or Moorestown businesses. Does anyone really believe this PAC for a “Great Mount Laurel” has Moorestown students’ best interests in mind? 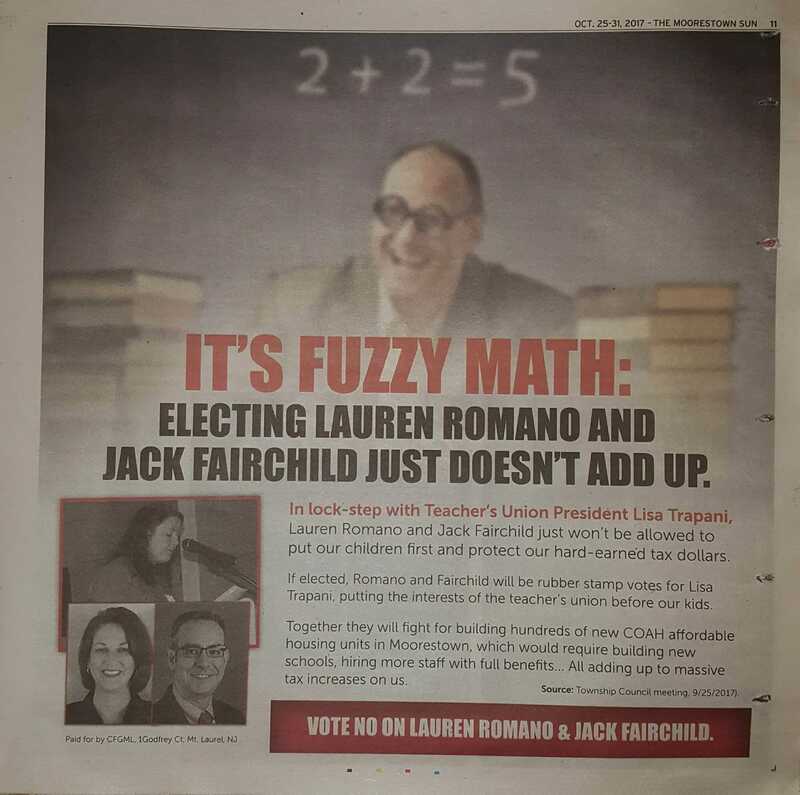 Perhaps not coincidentally, Romano’s and Fairchild’s opponents in this (supposedly non-partisan) BOE election were promoted by the Moorestown Republicans at an unsanctioned booth at the Moorestown in Autumn Day two weeks ago. Moorestown residents take note: An out-of-town PAC is trying to manipulate you in an attempt to undermine one of our town’s most precious assets, our public schools. Don’t fall for it!